Vietnam was about as alien a place to Walter Mason as Mars, but love prompted him to visit and after sitting in his Ho Chi Minh room crying for three days from shock, he ventured forth and found it was a country that drew him back time and time again. From bustling restaurants to the quiet serenity of Buddhist monasteries, this is a fascinating and entertaining read about a people and a nation that never fail to leae their mark on visitors. 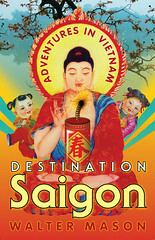 One thing Mason knows how to do is eat and it's his gusto for food, be it being beaten with a baquette in the back of a bus or taking a "pleasure jaunt" through an exotic Vietnamese supermarket, that is one of Destination Saigon's greatest pleasures. It's a worthwhile buy of you're heading that way.